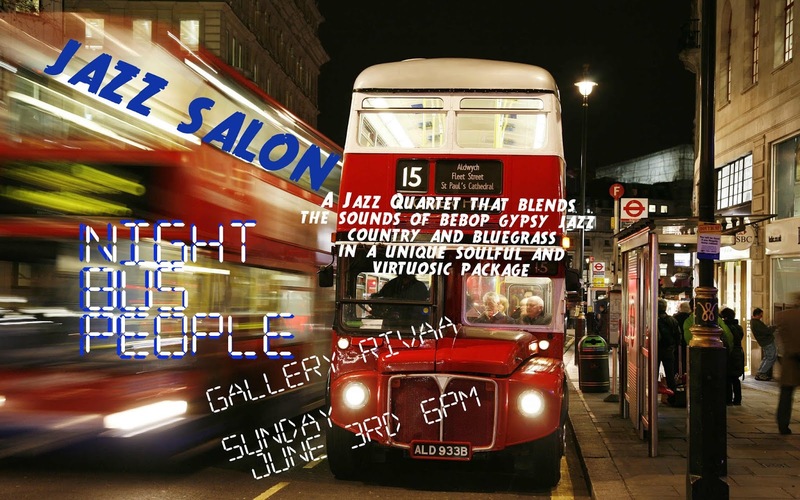 You're invited to the Jazz Salon at Gallery RIVAA, 6 PM Sunday June 3. Night Bus People is a new New York City based Jazz Quartet that blends the sounds of bebop, gypsy jazz, country and bluegrass in a unique, soulful and virtuosic package. Mandolinist and singer Jacob Jolliff currently tours with Yonder Mountain String Band and has performed with String Cheese Incident, Widespread Panic and the David Grissman Quartet. Jolliff won the National Mandolin Championship in 2012. Saxophonist Clay Lyons is an alumni of The Berklee Global Jazz Institute. Lyons recorded on Darren Barrett’s album the Opener, and has performed with The Rodney Green Quartet, Hillel Salem as well as many others in the NYC jazz scene and beyond. Bassist Myles Sloniker has established himself as a prominent young voice even among New York’s fractured musical cliques and has performed with a long list of eclectic musical luminaries including Ron Miles, Jeff Coffin, David Amran among others. Drummer Nate Wong is a Roosevelt Island resident and a native of Hong Kong who attended Berklee College of Music and has toured extensively around the World since performing at the Tokyo Jazz Fest, Mexico City Jazz Fest, HK Intl Jazz Fest as well as arenas such as Wembley Arena, Margaret Court Arena to name a few. So, stop by Gallery RIVAA tomorrow night starting at 6 PM to enjoy the concert.